Last time we took a clean mac os x 10.5.6 installation and upgraded it to a MySQL and Apache-PHP+ server. This hour we’ll turn it into a math2.0-test environment. That is, we will install WordPressMU (the ‘multiple user’ version of WordPress which can host 10 or 100 or thousands of blogs on your computer). 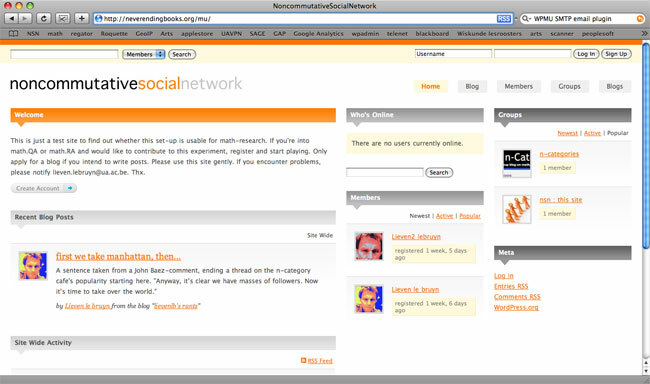 Then, we’ll turn this potential into a FaceBook-like social network. Probably it is best to test this just on your ‘localhost’ before going worldwide. Therefore, I’ll describe here the test-environment-version (the changes to make for going www I’ll describe later, but, they are minor). Here’s the first problem : WordPressMu doesn’t recognize ‘localhost’ as a valid domain, so we’ll have to use something like ‘localhost.localdomain’ and tell our server to recognize this new address. 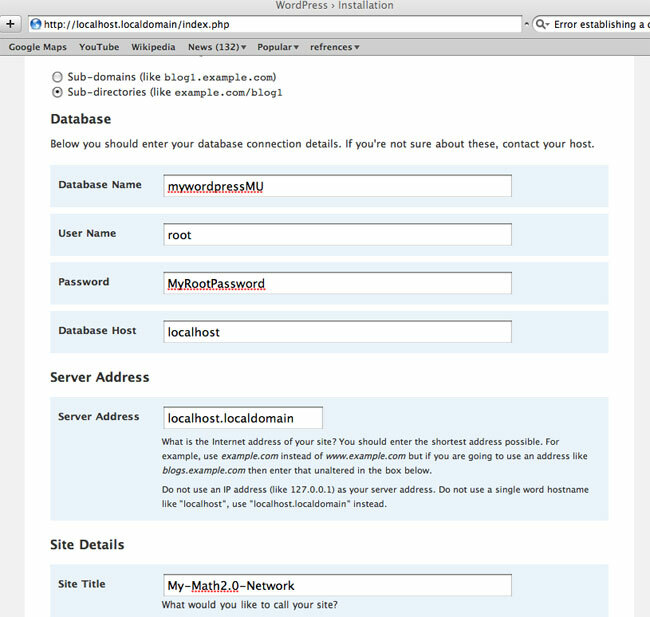 The OLD_PASSWORD-command seems odd, but is needed as WordPress doesn’t like the password-structure of MySQL 5. If you forget this, you’ll get database-errors. Open Safari and download the latest WordPressMU here. 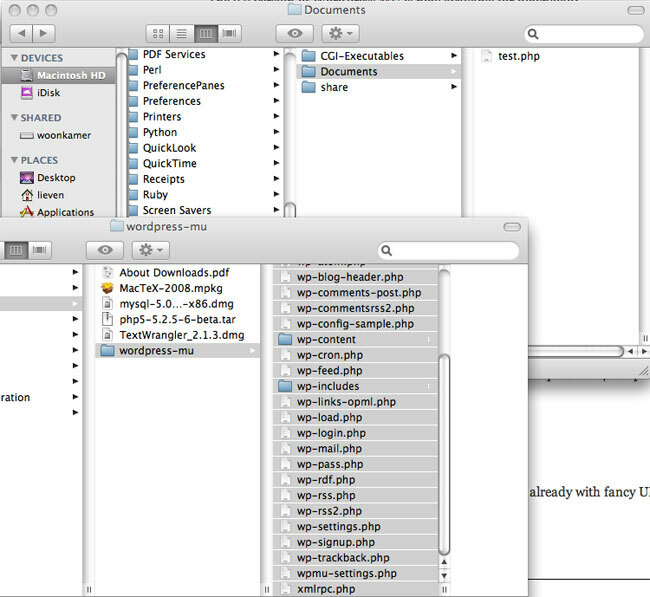 Open two Finder windows, one pointing to YourHome/Downloads (in which a new folder “wordpress-mu” is created and another one pointing to “Macintosh HD/Library/WebServer/Documents. You may as well drop the content of this Documents-directory into the Trash (the file test.php we created last time excluded). Select everything in the first-window wordpress-mu directory and drag all of it to the second-window Documents directory. You should get a success-page giving you the first password to login as admin. (In case you get a database-error, remove the wp-config.php file, redo the OLD_PASSWORD command given above and repeat the install. Everything should work!). Do this, go to the Users-tab and edit your admin-account to change the password (at the bottom) to something you can remember easily. 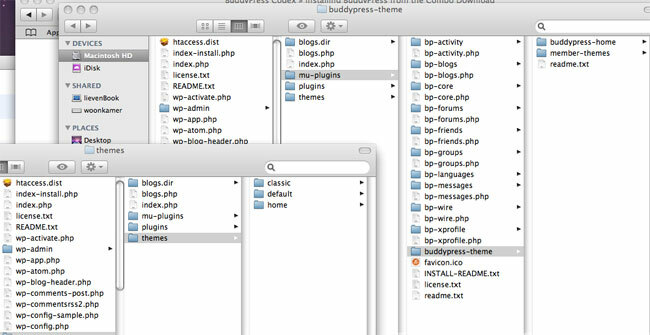 We start by getting the BuddyPress Combo Download (say the .zip file) which will create a buddypress-combo directory in YourHome/Downloads. Open this directory and as before drag its entire content to /Library/WebServer/Documents/wp-content/mu-plugins. 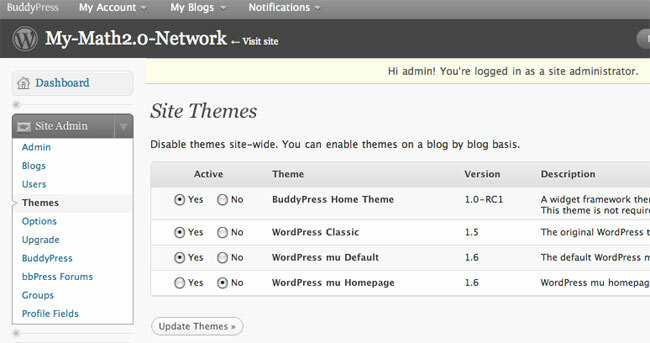 Log in again as admin in your WpMU via http://localhost.localdomain/wp-admin/ under Site Admin/Themes activate the BuddyPress Home Theme and press the ‘Update Themes’ button. Similarly, in Site Admin/Options mark under ‘Allow new registrations’ the option ‘Enables. Blogs and user accounts can be created’ and update these options via the button at the bottom. Finally, under Appearance click on the BuddyPress Home Theme and activate it (top right). Now, visit your site and change it to your liking via adding widgets. For example, add ‘Welcome’, ‘Recent Blog Posts’ and ‘Site Wide Activity’ to the left column, ‘Who’s Online’ and ‘Members’ to the center column and ‘Groups’ and ‘Meta’ to the right column. Next, create new users (via Site Admin/Users and not via signup as this is just an offline test-version and signup sends out activating emails…), create groups, blogs and posts, let users befriend one another and send wires, etc. etc. all the things people do in a web2.0 environment. 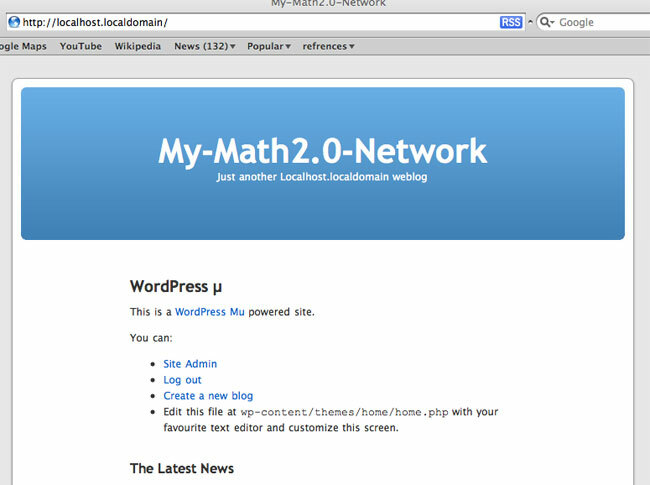 Finally, if your iMac is a proper web-server (that is, has its own URL) you can take your math2.0-network worldwide repeating the above procedure with obvious modifications (that is, replacing localhost.localdomain by the URL of your machine). In order to get the signup/email system going you may need to install the Swift-SMTP-Mailer plugin and feed it your outgoing mail-server (also you’ll have to enable plugins in the SiteAdmin/Options). Previous Post can -oids save group-theory 101?